Review by AllTheBestFights.com: 2015-10-03, pretty boring fight between Joseph Benavidez and Ali Bagautinov: it gets two stars. Joseph Benavidez entered this fight with a professional mma record of 22-4-0 (68% finishing rate) and he is ranked as the No.2 flyweight in the world. He suffered his last loss in 2013 when he faced #1 Ufc Flw champion Demetrious Johnson in their rematch (=Johnson vs Benavidez 2), after this bout he has won three consecutive fights beating John Moraga in his last one (=Benavidez vs Moraga). His opponent, the 2012 world combat sambo champion Ali Bagautinov, has a record of 13-3-0 (69% finishing rate) but he is not ranked as he hasn’t fought since June 14, 2014 when he was defeated by Demetrious Johnson (=Johnson vs Bagautinov). 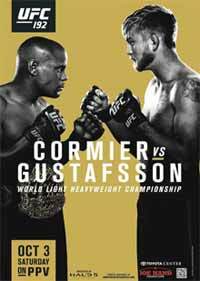 Benavidez vs Bagautinov is on the undercard of Daniel Cormier vs Alexander Gustafsson – UFC 192. Watch the video and rate this fight!